The biggest ongoing investment that airlines and aircraft owners alike make in their aircraft is fuel costs. In fact, airlines spend over 25% of their operating expenses on fuel. It’s no wonder then that the aviation industry is always looking for new and better ways to improve aircraft efficiency and reduce dependence on expensive fuels. While advances in propeller design have delivered an advanced variable propeller system that can be manually or automatically adjusted to achieve great flight efficiency, wing shapes have remained fixed. For the last thirty years, aviation engineers have worked on developing a “twisted” wing that could be adjusted in flight to improve fuel efficiency. Just as a variable pitch propeller adjusts with the speed and altitude of the aircraft, so too would the wings. In early 2006, mechanical engineering professor Sridhar Kota, funded by U.S. government contracts, developed and tested a bendable FlexFoil wing material. FlexFoil was developed using aluminum alloys and composites. The internal structure of the FlexFoil was created so that putting pressure on specific points in the structure can change the wing’s shape depending on how much force is applied to that area. To achieve an equally flexible outer covering, the team developed elastic mechanisms that covered an elastomer skin. This created a bridge across the wing that was able to expand and contract as the FlexFoil did. This completely smooth cover – unblemished by external hinges or seams – could also help reduce an aircraft’s landing noise by up to 40%. Testing indicated that using FlexFoil in place of traditional rigid wing flaps could reduce drag and improve lift over drag by up to 10%. 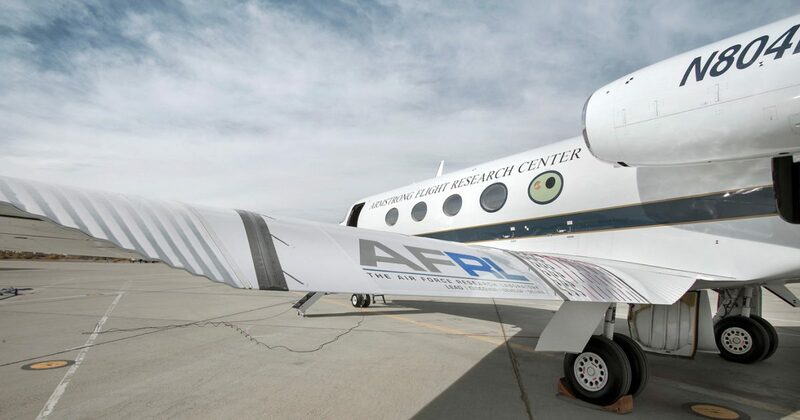 Studies of the initial flight data back in 2006 indicated that equipping aircraft with this more flexible wing could result in a fuel reduction of 8-12%. In 2009, Kota and his team retrofitted a Gulfstream III aircraft to test the FlexFoil on the wings. The project took five years to design and test. When it finally took flight, the team was able to successfully manipulate the shape of the wings from 2 degrees up to 32 degrees down. According to Kota, it can take 15 years or more to develop, test, and finally roll out a new aviation technology. That’s why you likely won’t see the application of this technology on a commercial flight until 2020. His team is also testing how this material could enhance the performance of propeller blades for aircraft, submarines, boats, and even wind turbines.